On a very high tide the water will flood the salt marsh right up to the tree line. Salt marsh, what is it? A salt marsh or salting is an area of coastal grassland flooded daily by the incoming tide. A really high tide will swamp the entire marsh so only salt loving plants can exist here. These highly nutritious plants and the surrounding food rich mud is irresistible to wildlife. So this is a very important and unique ecosystem with rare and unusual species of plants and animals. Why are salt marshes so important? As well as providing food for wildlife, salt marshes buffer the erosion effects of waves protecting land behind from flooding. They also capture and store carbon and are thought to play a significant role in regulating local and global climate. So important are salt marshes, that man-made ones are being created like the one at Steart in Bridgwater Bay in the Bristol Channel. 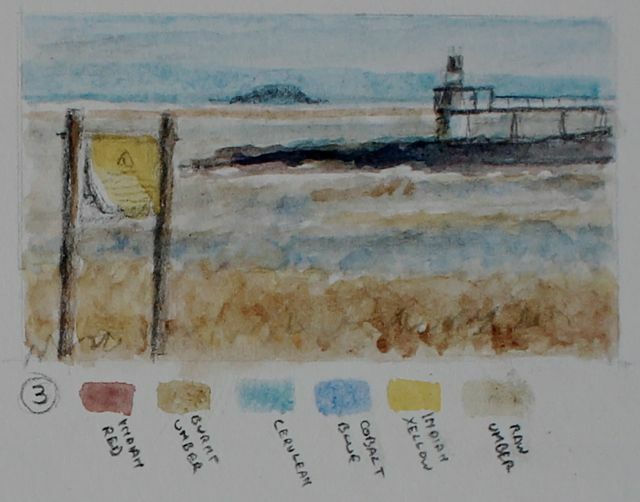 My nearest salt marshes are two pocket-sized marshes on the Severn Estuary, the top end of the Bristol Channel. The Kings Road, which is a busy deep water shipping channel runs along the edge of these salt marshes. It provides an exciting backdrop as vessels navigate in and out of nearby Royal Portbury Dock. Both salt marshes are within sight of the two Severn Bridges, the welsh coastline and the small Denny Island. The salt marsh at Battery Point . . .